A Birthday card is the number 1 reason for making cards and with new products they just don't get boring to make! This card was made for one of my lovely friends and team member who celebrated her birthday this week. 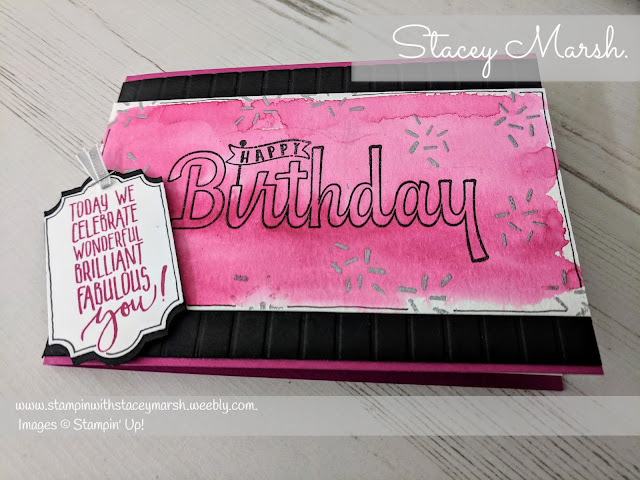 ​This stamp comes from a new set called Birthday Wishes and was one of the first products that jumped out of the new Spring/Summer catalogue when I first had a look at in back in November lasy year. It's a great size and means that you don't need to dress it up too much. It comes with an extra sentiment that I have used inside that says "With Many Wishes Just For You" . I definitely think you are going to see a lot of this one around! Happy Birthday has been stamped onto Watercolour Paper using Versamark which I have them heat-embossed with black embossing powder. The confetti has been added in the same way with Silver Embossing Powder and a stamp from the new Picture Perfect Birthday Stamp Set. To add the wash of colour , I have spritzed the card lightly and then using an Aqua Painter and a Berry Burst Ink Pad I have brushed the colour across. This can be left to one side to dry but I prefer to dry with a heat tool straight away. I find that this avoids any drips of ink where you don't want them. Behind the Watercolour Paper I have embossed a piece of Basic Black cardstock using the new Simple Stripes Textured Impressions Embossing Folder. The verse comes from Picture Perfect Birthday Stamp Set. I have stamped this onto Whisper White cardstock and punched out using the Everyday Label punch. To add the Black layer, I have cut 2 more in Basic Black cardstock. Cutting one in half, I have attached to the reverse of the original so that your can see a border of black at the top and the bottom of the label shape. Taking the 2nd Basic Black label shape, I have attached this to the reverse to cover up the gap. Using some Silver 1/8" Ribbon I have added this to the label shape using a staple to secure and attached to the card using Stampin' Dimensionals to add some more depth. All of these products are available to buy now by clicking shop now. Remember all orders of £45 or more mean you can add a free Sale-a-Bration item!